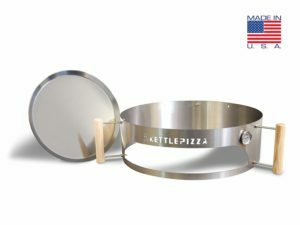 If you already own an 18.5″ or 22.5″ kettle grill / bbq or have your eye on one at least, then this ‘Made in USA’ kit will transform it into a fully functioning charcoal or wood burning pizza oven. 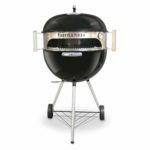 It’s made of 20 gauge, 304-grade stainless steel, so is substantial and most importantly, easy to keep clean when the time comes. The unique open end design allows air to flow equally over the top and bottom of the pizza, so not only does the base become crispy, but the topping is perfect too. It also means you don’t have to continually open and close any doors to check on the pizza, so the temperature remains regulated a lot better. The riser sleeve can be installed in minutes, simply sitting on top of the grill with the lid on top, and the optimum temperature can be reached in minutes without any risk of the heat escaping. A standard 7” pizza can be ready in around 3-4 minutes, which is a lot quicker than preheating your indoor oven and grabbing one from the freezer. 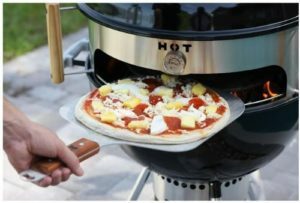 The small, simple design means it isn’t a big bulky clay pizza oven that you can never move from the garden. It stands at only 7 inches tall and 15 inches diameter, with a weight of 3.63 kg. This makes it easily transportable if you want to take it round to a friends house for a get-together, or if you like to take your kettle barbecue camping with you and want another option for dinner one night. The two handles at the side make it easy to grip and move about, as well as being heat resistant to avoid any nasty accidents. With a subtle design, it won’t stand out, so you don’t have to worry about your garden’s aesthetics being ruined. Although it comes with an aluminium tray, it would be compatible with a pizza stone if you want to go all out and recreate the professional feel. There is also an inbuilt thermometer gauge at the front to ensure the perfect setting is reached before you begin.